Ryan: This last week, I helped my mother clean out her garage. To be fair, most of my help came in the form of going through boxes of my childhood things and deciding what was to go to Goodwill. There was an Archie Comics digest in almost every box. At this point, I’ve probably read more pages of Archie than any other book. I also found a Burger King Toy with Veronica in a convertible and my Gumby-style Betty doll. There was no Archie figurine in my things. That’s for a simple reason; I think he’s kind of a jerk. It’s not that he’s a bad guy, but he has never been my favorite. I love the rivalry/friendship between Betty and Veronica, but the love triangle element was never that interesting to me. Mainly because his unwillingness to choose between Betty and Veronica made him a compassion-free cad and turned them into doormats. Mark Waid and Veronica Fish present my favorite version of Archie, because they treat him and every other character in the story with empathy and humanity. In Archie 9, both the central conflict and the love triangle develop in a world where everyone is doing their best and there are no villains. 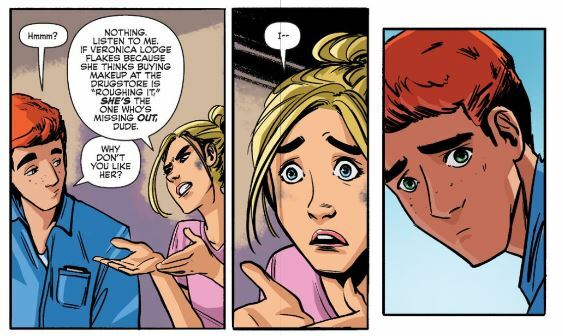 The issue begins with Archie banned from Lodge manor and Veronica intent on spending time at his house. As an heiress whose whims have always been indulged by Daddy-kins, Veronica makes herself useful by spending money and buying comforts for the Andrews family. Her generosity and lack of understanding about the “common life” lead to a bit of angst. Archie is dejected at the idea that Veronica’s different background will be the end of their relationship, and Betty tries to cheer him up which triggers some of her own feelings. The issue ends with Veronica and Archie learning to compromise and love tuna casserole, while Betty cries underneath a car. No one is a jerk and no one is a doormat. Waid and Fish achieve this by focusing not on exposition and heavy plotting, but on smaller emotional moments. 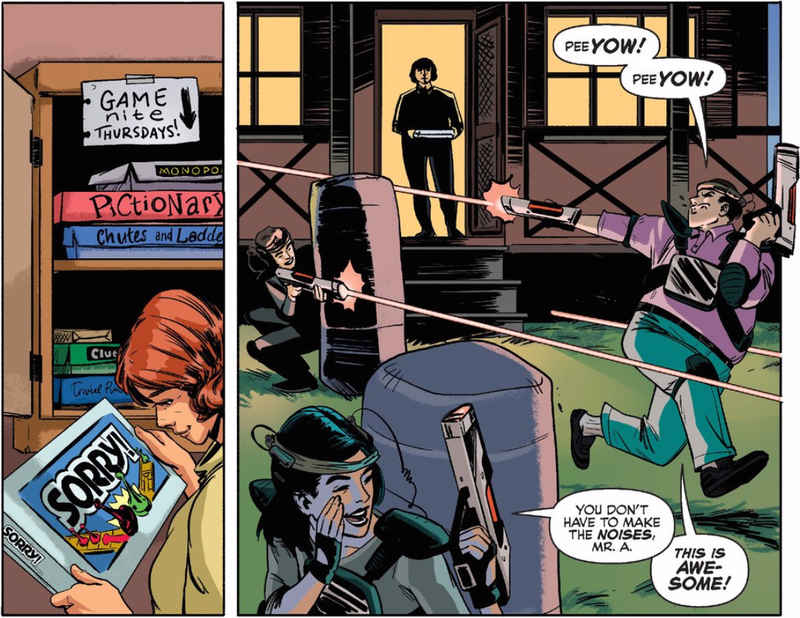 In the first page, Waid and Fish illustrate the class conflict at the center of the issue. There is more to be said about the interpersonal relationships and emotional interplay within the story, but the basic idea is laid out here. Veronica, through the labor of a proxy, offers a gift to the Andrews family, but it doesn’t jibe with their lifestyle and makes them uncomfortable. The family in the painting wear suits and Mrs. Andrews has a freaking tiara on her head rather than her plain real-life Chico’s ensemble. Veronica directs the artist and from the sweat on his brow, looks to be a tough taskmaster. It’s fitting that as Archie speaks directly to the reader, Veronica’s face is obscured. For most of the issue, Archie is without insight to Veronica’s emotional state or point of view. 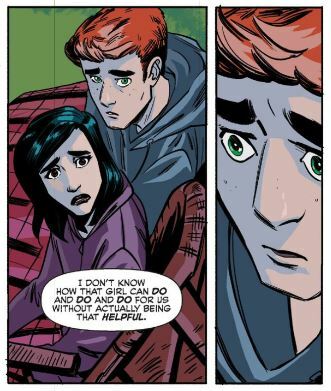 Archie may be our narrator, but Waid and Fish are sure to show us that he is not the only person in the story with feelings. Fish has Veronica’s pain-filled expression facing out fully. Archie is in the near background and turned partially away. The reader can see that the impact of Mrs. Andrews comments are landing very hard on Veronica. But, Archie doesn’t see that. His brain has started down a related but more self-involved path. Veronica is hurt, both by Mary’s words and the truth lying beneath them. In her breakdown in the supermarket, it’s clear that she feels out of her depth with the kinds of things Archie takes for granted. Though, I think that it’s a little weird that Mrs. Andrews has Vegetable Oil, Shortening, AND Pam on her list. How much saturated fat is in the SAD (Standard Andrews Diet)? Maybe it’s all the cholesterol, but after hearing his mother inadvertently insult Veronica, he doesn’t spare a thought to how she is dealing with the slight. Instead, he worries that she will break up with him. So, obviously, he complains to his ex-girlfriend about his fear of losing his current one. Betty’s emotional turn in the sequence above is handled perfectly by Fish. In the first panel above, Betty’s eyebrows ride low on her brow as she cattily defends Archie. Then, when he forces her to admit what lies beneath her antipathy, her face is as open and vulnerable as can be. It’s not just the expressions. By focusing the attention on Betty’s stricken face in the center panel, Fish is able to show that Archie is allowing himself to see Betty’s pain. The size and placement of the panels also transitions the talky dialogue to a more emotionally grounded moment between life-long friends. The storytelling throughout the issue is efficient without being expository. For example, we see Mrs. Andrews disenchantment with Veronica’s influence explored in half of a page. Mary’s mood is expressed through the music she makes and as we see later with Archie, that sound is shown with very expressive musical notes. Mary’s whistle in the first panel above thrusts into the air with a pleasant verve. In the last panel, the notes seem to be falling off of the page. It’s a simple moment in Mary’s day, but acts as the epitome of the writing maxim, “show don’t tell.” We don’t need to be told that Mary enjoys gardening, nor that she has a routine. 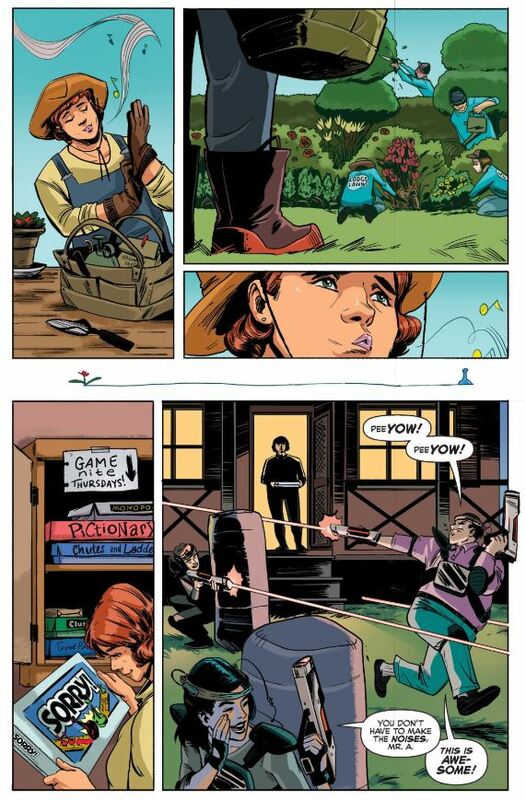 It’s all made clear in that first panel as she gathers her tools and puts on her gloves. The choice of Gardening as Mary’s hobby also has significance. It’s a practice of patience, quiet and a willingness to get dirty. Not to be a jerk about it, but Mr. Lodge couldn’t maintain a garden if his life depended on it. By extension, this kind of landscaping is exactly the kind of thing that Veronica would not understand. The Lodge household is all about results. Mr. Lodge wants to complete his mansion, win the election, and get Archie out of his sight. What he doesn’t understand is that life cannot be reduced to the bottom line. Drew, what do you think of the issue? How bout the development that old teen drama staple, the love triangle? This is the most time we’ve spent with Mary Andrews. What do you think about the way her character was established? Also, Archie doesn’t destroy anything with his klutziness, how do you think the issue’s humor fares without any Archie-related disasters? Do you think the Lodge manor shark is tried to attack red haired teens with rock and roll aspirations? Drew: You know, that sequence with a shark is fascinating to me. Many of the past few issues have opened with the same kind of metaphorical image we see in the painting. They tend to wrap up the themes and sentiment of the issue in a single image that more-or-less acts as a second cover. 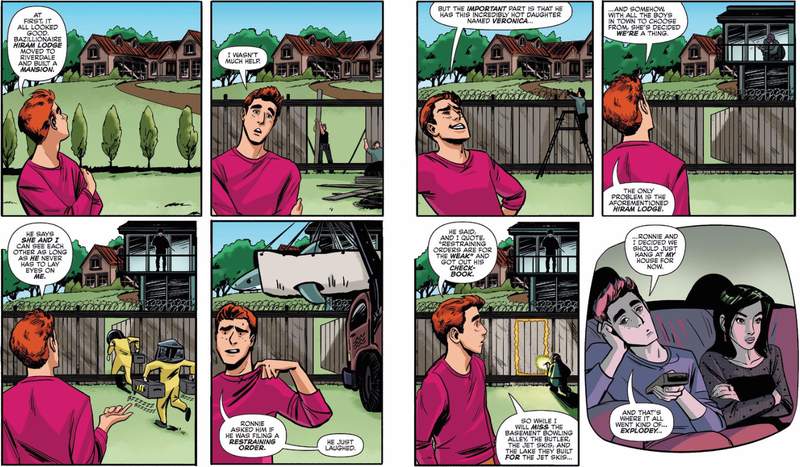 But that kind of visual metaphor tends to be used sparingly outside of that opening page — generally, when we see something happening in the pages of Archie, we understand that it actually happened within the diegesis of the story, no matter how cartoony; Jughead actually eats all of that food, Archie actually knocks down the Lodge Manor, Veronica actually breaks down in the aisle of the grocery store. Which makes the sequence with the shark somewhat ambiguous. Archie’s line about Mr. Lodge using his checkbook to keep Archie out of Lodge Manor suggests that he really did build a fence around the property. The Barbed wire might fit with that, but the guard tower, crates of bees, and shark push the absurdity beyond even the cartoony limits of this series. That is, they read better as a metaphorical representation of Mr. Lodge’s hatred for Archie (or, better yet, Archie’s feelings about that hatred) than as real events — at least in my mind. Interestingly, the sequence works either way; it’s still funny, strange, and revealing whether or not these panels depict objective or subjective accounts of Mr. Lodge’s reactions. This may feel like a trivial point, but Mary’s ingrown sense of politeness is essential to this story; if she had been more honest with Veronica as soon as those gifts arrived, this conflict would have taken a very different shape. Moreover, it feels remarkably familiar to me — I’ve lived in Michigan, Wisconsin, or Illinois for most of my life, so I grew up on this exact sense of polite passivity. Point is, it’s not just a plot device — it’s a revealing character moment. I’m a little less enamored of Betty’s inability to express her feelings. I absolutely believe embarrassment or shyness as a reason a teen wouldn’t tell their ex their real feelings — especially if that ex is dating somebody else — but it doesn’t feel like it offers us much insight into her character. She’s acting as a more generic teen drama character than anything here. Obviously, this issue doesn’t need much more from her, which is why I’m so pleased with your assessment of Archie’s emotional clumsiness, Ryan. Betty’s playing the straight man to Archie’s emotional slapstick. The result is more tragic than funny, but his obliviousness is what makes that scene (and situation) interesting. He might need Betty to tell him her feelings for him to ever figure them out, but I suspect that might not happen for a while. For the time being, I’m happy enough with the Archie and Veronia pairing. She was introduced as kind of a monster, but each subsequent issue has revealed more and more humanity beneath that manicured exterior. Her desire to remake the Andrews household to her specifications is a tad selfish, but she’s also trying to help. She may be out-of-touch with what people need (another reason her relationship with Archie works), but she genuinely wants to help. That’s a character I can get behind — especially if she’s going to be trying to navigate those waters in a world full of midwesterners unwilling to tell her when she’s doing it wrong. Great write up, but neither vegetable oil, Pam, or almost any shortening people use these days contain cholesterol. Other than that, I LOVE this deep dive. 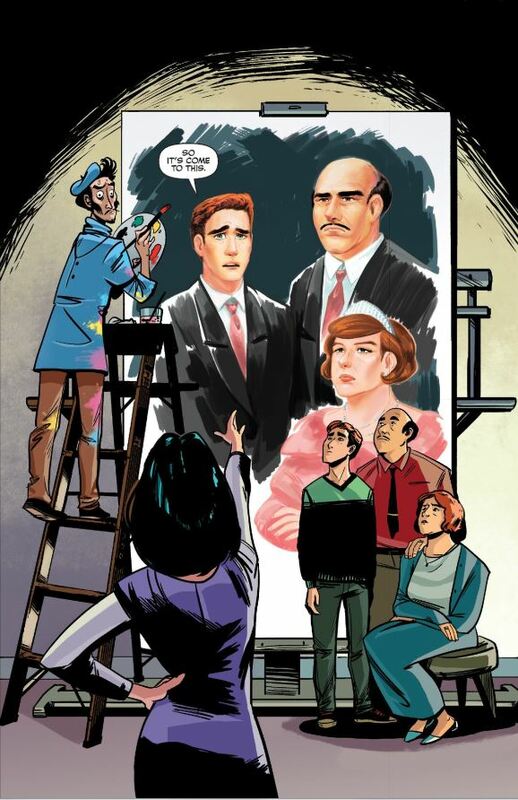 this Archie reminds so much to The Middle,another series where the tension comes from day to day shaenanigans of a family without real evil or satire of any kind,both are wonders in this day and age. Of course,they have a total revamp of their main title which is super popular and well regarded,get to adapt it for TV for the 1st time(how is that possible!!??) and… they make a Twin Peaks wannabe?really odd choice.